November 15, Augusta, NJ – The Can-Am League officially released their 2019 schedule today, and the defending champion Sussex County Miners will raise their 2019 championship banner at Skylands Stadium on Friday, May 17th against the Rockland Boulders. The Miners title defense will begin the night before at Palisades Credit Union Park. Miners season ticket plans for the 50-game home schedule are on sale now. Fans who purchase season tickets before Thanksgiving can save $50 on their season ticket plan. 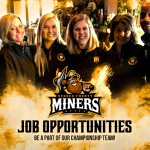 For more information, visit sussexcountyminers.com/seasontickets or call 973-940-0222. Error: Error validating access token: Session has expired on Monday, 11-Mar-19 14:30:33 PDT. The current time is Thursday, 25-Apr-19 09:20:17 PDT.